Suri Cruise demonstrated her love for Monnalisa jackets this winter! 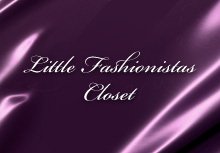 She was seen wearing in one of her four Monnalisa jackets almost every day! 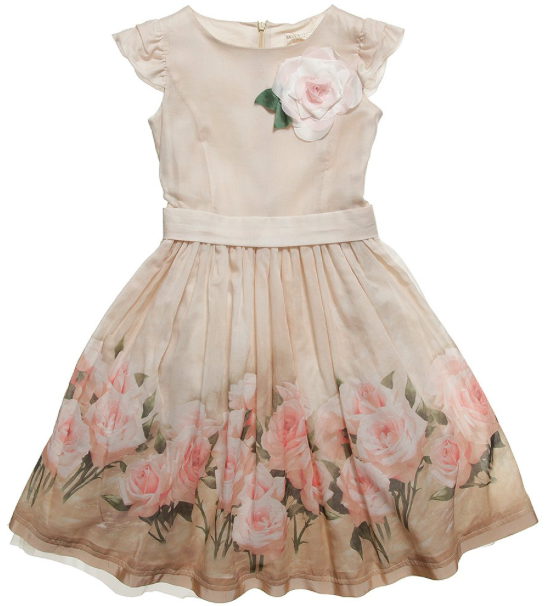 Winter is almost over.. and Monnalisa is ready for spring with amazing dresses and variety of floral prints. Will we see Suri wearing one? 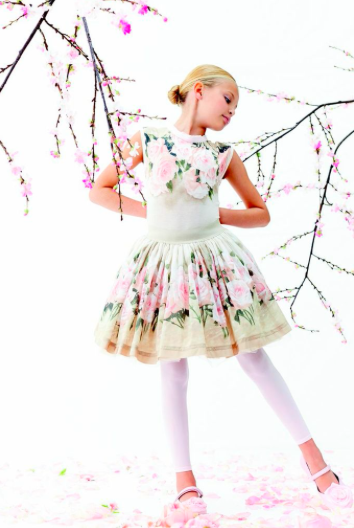 The Spring/Summer 2014 Monnalisa Chic collection for girls, announce the arrival of the warmer months with blossoming flowers delicately unfolding over dusty pinks, blushing blues, pale greys and shimmery silvers, embellished with girlish bows and soft pleats. The cotton is cool and the knitwear is weightless. 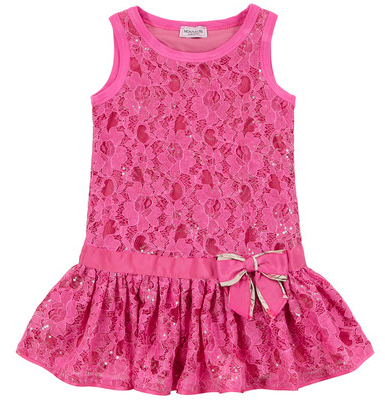 #2 - Geranium Lace Dress - ultimate Suri's favorite for the "ALL-Pink" look! 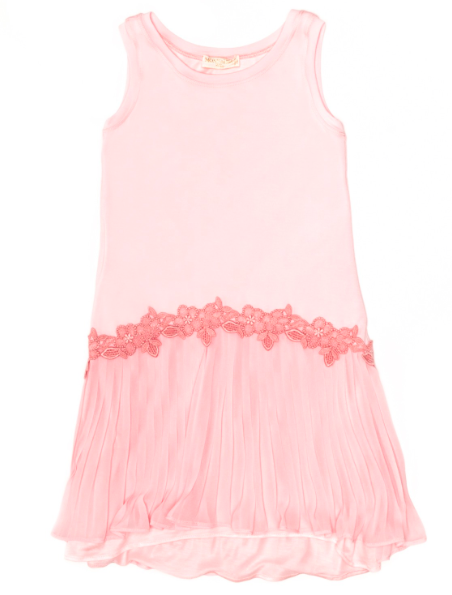 #3 - Rose Embroidered Plisse Dress - Must Have for Summer's many occasions: fancy tea party, wedding celebration or attending siblings graduation! February 2014: Suri out on Wednesday & VD plans! 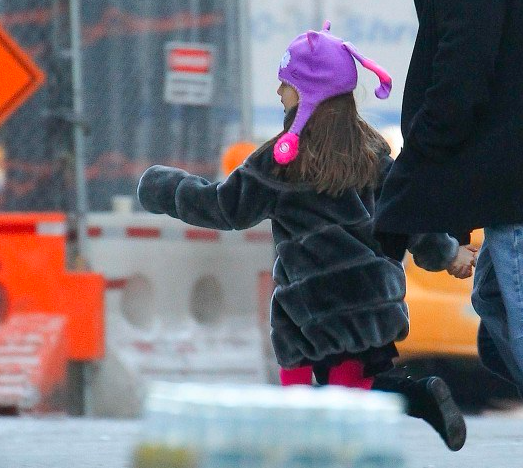 Suri Cruise spotted out in NYC with a friend on Wednesday, February 12th 2014. Katie was seen in this poncho, while out in NYC with Suri on September 26th 2012.
outfit info: cardigan, leggings, boots - all by crewcuts. Katie's knitted chevron poncho by Missoni. Valentines Day plans for S&K: “Girls’ party! With 7-year-olds” Katie told JJ with a smirk about her Valentine’s Day plans at the show. Suri Cruise spotted leaving The Avenues school in NYC on Monday, February 10th 2014.
cardigan & leggings by crewcuts, boots by ugg. Suri Cruise arrived to school on sunny morning in NYC on Tuesday, February 11th 2014. She is wearing Fuchsia Double Collar Puffer Coat FW13 by Monnalisa. outfit info: shoes by puma. 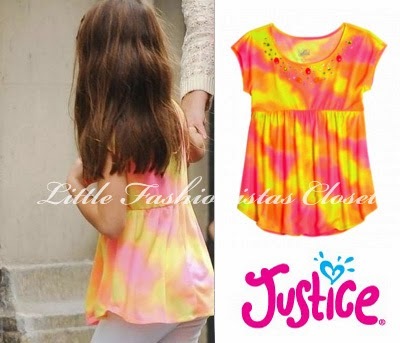 Its been about a month since Suri Cruise and Katie were spotted out & about together. Today - Saturday, February 8th 2014 - S&K met up with some friends and headed to the ice-rink at Bryant Park, NYC. 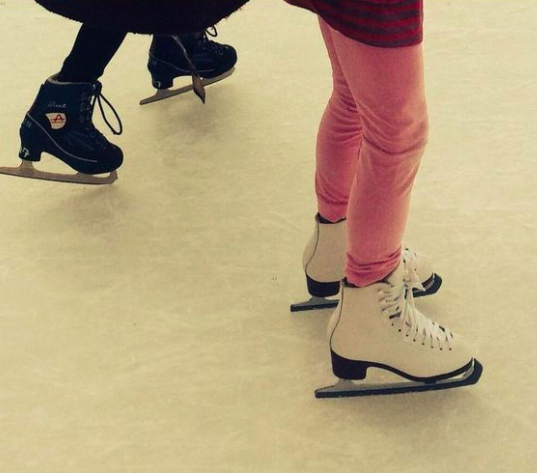 Katie tweeted this photo of Suri on the ice with caption: "Wonderful to skate with friends"
outfit info: Lauriane Pink Jacket SS13 by Moncler (first worn on August 27th 2013), Twitchy Kitty Purple Hat by Flipeez, Heista Striped Dress SS13 by Little Marc Jacobs (first worn on April 23rd 2013). 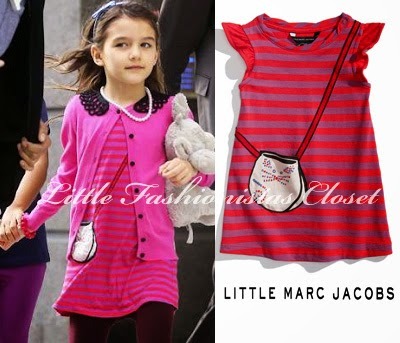 check out >>> Harper Beckham also in Marc Jacobs and in New York! 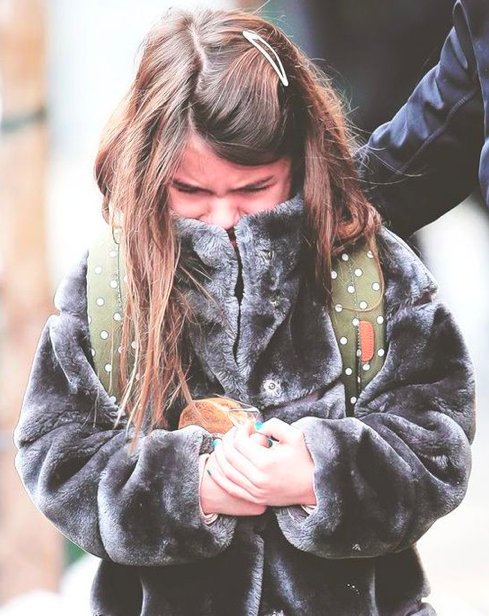 Suri Cruise putting on a coat to keep warm in chilly NYC on Thursday, February 6th 2014. Suri was wearing new Blue Pleated Uniform Skirt by Izod (available at JCPenny & Macy's). Suri was keeping warm Grey Faux Fur Coat FW13 by Monnalisa. outfit info: cardigan & leggings by crewcuts, sneakers by puma. 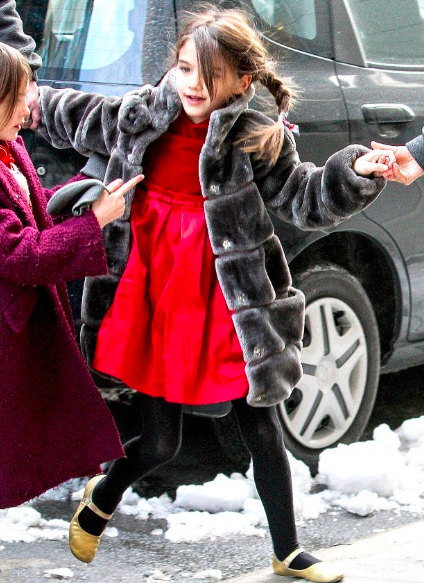 Suri Cruise looks upset while leaving school with cookies in her hands.. NYC, February 5th 2014.
outfit info: Grey Faux Fur Coat by Monnalisa and Leandra Disco Ball Shoes FW13 by Jessica Simpson. Thanks to Florence for the id!!! Suri Cruise donned traditional Red & Gold colors to celebrate Chinese New Year at The Avenues School on Friday, January 31st 2014.
outfit info: Grey Faux Fur Coat by Monnalisa, Red Puff Sleeve Dress FW12 by Il Gufo (first seen in August 2012) and Gold Button Leather Slipper Shoes by Rachel Riley. Suri Cruise spotted out in NYC with her entourage on Thursday, January 30th 2014. Suri was wearing Twitchy Kitty Purple Hat by Flipeez. Thanks to Isabelle for the id! outfit info: Grey Faux Fur Coat by Monnalisa and Blue Wool Pleated Skirt FW13 by Gucci, Black Suede Riding Boots FW14 by GAP.